Intel has frequently been in the HEXUS news over recent months as various 'chip-celebs' have been hired. There is clear evidence that the firm has decided to up its game in competing with the revitalised AMD, and to open up a new front in the GPU wars, largely by hiring ex-AMD talent. Today we see news that one of Intel's previous well known hardware developers of old, Tom Forsyth, will be rejoining the blue team as a chip architect. 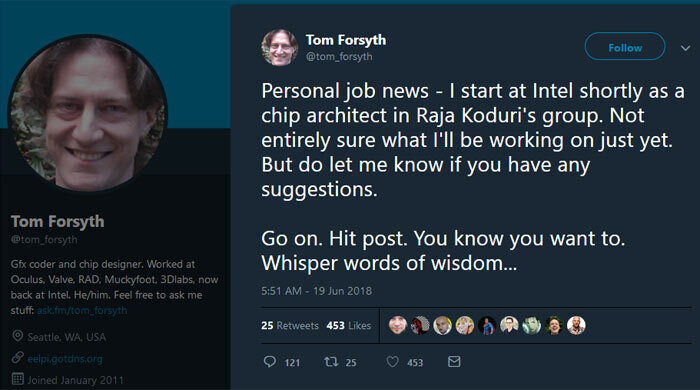 Via his personal Twitter account yesterday, Tom Forsyth announced that "I start at Intel shortly as a chip architect in Raja Koduri's group". Forsyth admitted that he was "not entirely sure what I'll be working on just yet." As Koduri's group is dubbed the 'Core and Visual Computing Group' there is quite a wide scope of possibilities for the application of Forsyth's talents. Considering for a moment, Forsyth's history, he was one of the key architects at Intel behind the Larrabee many-core vector processor and the instruction set which is today known as AVX-512, and the Xeon Phi which built on the idea of using GPU-style highly parallel processing for general purpose computing. In more recent posts, Forsyth has gained experience at the likes of Valve, 3Dlabds, and Ocuclus. Tom Forsyth has his own tech blog. If you choose to have a quick browse it is quite worthwhile to check over the article he wrote back in August 2016, on "why didn't Larrabee fail" in which he argues the project was a "huge success". so it really is Larrabee take 2. I told you! I'll wait for this one to never be released either. But it was an HPC board all along, it was never a video card. Intel wouldn't lie to us would they? Say it isn't so! which ever way you look at it… Intel are vacuming up the brains and making what they think will be the talent pot of the decade. Throwing a lot of brains into a room doesn't always make a brilliant product, however. Unless they go with a fixed target and exercise restraint, they could end up with Larrabee 2 and it being considerably useless to the market. I suspect that Intel are going to follow the grain and make conventional GPUs and Logic Boards similar in design to the competition but exercise their expertise in making high performance silicon…and that's about it. They got burnt by Larrabee 1 so I doubt they want to do that again.